I think we could see more acres come out of Prevent Plant and that is why I think the corn and/or soybean acres have a change to be a bearish surprise. In other words – possibility of higher acres than estimated. Soybean exports and the crush have been strong. I would not be surprised to see lower stocks than estimated. I have been hearing reports of feed wheat favored over corn in areas where lower protein HRW wheat is grown. 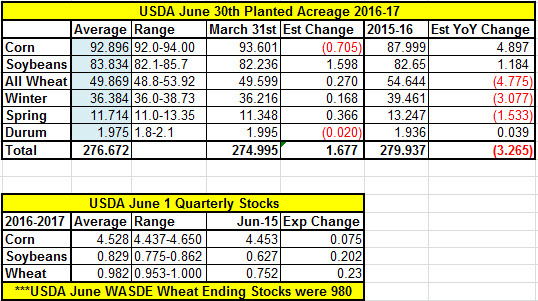 If this is widespread then we could see corn stocks higher and wheat stocks lower due to the feed usage (more wheat for feed and less corn used for feed).